This strategy promotes active discussion by using role cards and uses colors to differentiate for different skill levels. The example below assumes that you are using blue for the less able and green for the more able students. 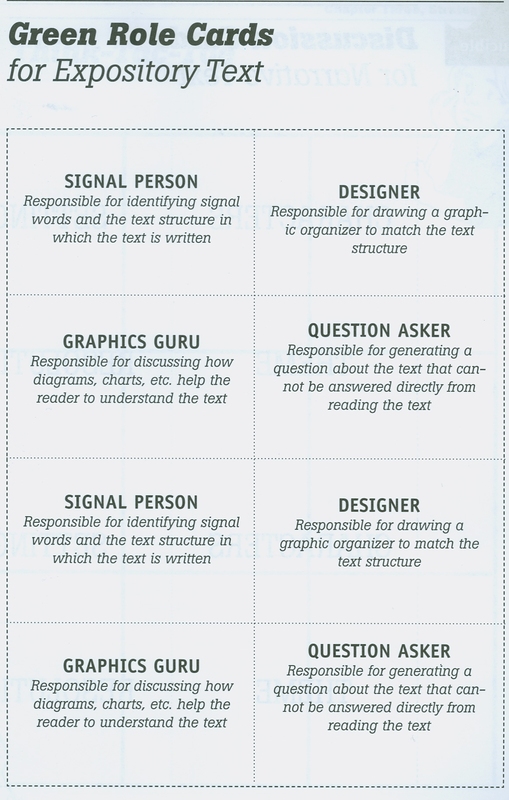 Make one poster-sized copy of the Pointer/Signal Words Chart (located to your right) and post it in the classroom for student reference. Copy, laminate, and cut the Blue Role Cards for Expository Text and the Green Role Cards for Expository Text (both are located to the right). 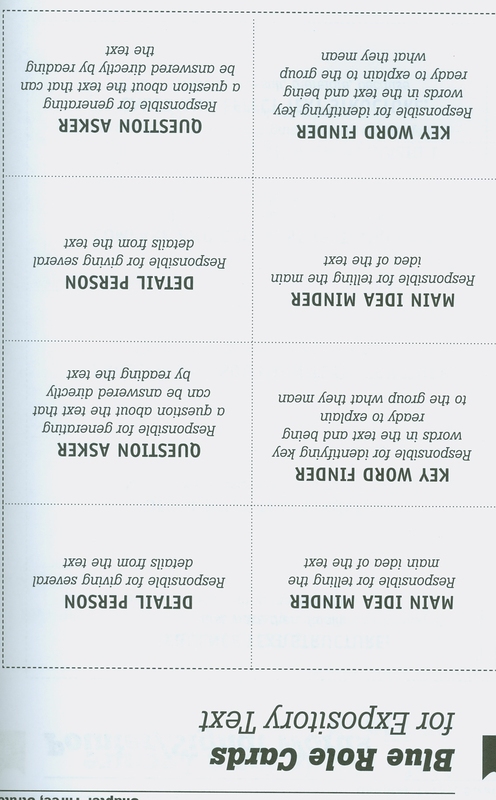 Make enough copies so that each student will receive a card that is appropriate for his/her readiness level. Divide the students into homogeneous readiness-level groups of four and give each student in each group one of the individual cards from the reproducibles. (Make sure each group has cards for all four roles). Tell students to read their cards to find out what their individual role will be for the group discussion. Students read the chapter or section of the book. Provide time for group discussion. Each group member should participated based on the role on his/her card. Give each group a large sheet of paper and some markers. Ask each group to figure out a way to show the key elements of its discussion by making a graphic representation on the large sheet of paper. Have each group present its graphic representation to the rest of the class.